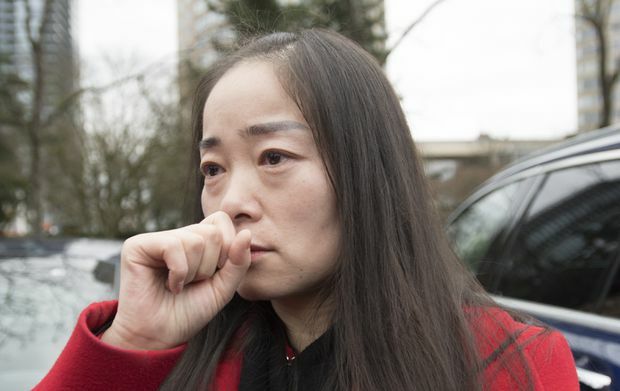 Former Burnaby-South Liberal candidate Karen Wang reacts to being asked to leave the site where she had called a news conference in Burnaby, B.C., on Jan. 17, 2019. A former Liberal candidate in the Burnaby-South by-election says she may run as an independent after being rejected for a second time by the party. “I will consider this as an option. It will all depend on my volunteers. My key supporters and people in the community,” Karen Wang told reporters during a chaotic news conference in the parking lot of the main branch of Burnaby’s library system. Still, she conceded her political career may “probably” be over after being defeated in the 2017 provincial election where she ran as a BC Liberal, being rejected by the federal Liberals this week, and also being criticized by the federal Conservatives. Earlier in the week, the operator of three daycare centres in the city, east of Vancouver, was ousted as a federal Liberal candidate over social-media comments referencing the ethnic background of federal NDP Leader Jagmeet Singh, also a candidate in the Feb. 25 by-election. Thursday began with Ms. Wang planning to appeal for a second chance to run as a Liberal. By mid-day, however, the federal party had said they wanted nothing to do with her. “The Liberal Party has accepted her resignation as a candidate and she will not represent the Liberal Party in the Burnaby South by-election,” Braeden Caley, the Liberals senior communications director, said in a statement responding to Ms. Wang’s interest in seeking a second chance. On Wednesday, Mr. Caley said Ms. Wang’s online comments were not aligned with the values of the federal party. On Thursday, he was reinforcing that message when asked about her bid for another chance. Ms. Wang said on Thursday that the remarks were written by campaign volunteers on her social-media team. “By accident, we mentioned his Indian-Canadian background,” she said. She said she is not a racist. Ms. Wang convened a news conference on the grounds of the main Burnaby library, arriving with her mother and sister. However, Beth Davies, the chief librarian, was on hand as the party arrived to say they had no permission to meet the news media there. That shifted the news conference to the parking lot of the facility. She said she wanted Chinese people to come to her events, be motivated, and support her as part of an engagement in politics. Federal Conservatives were dismissive of Ms. Wang this week. Mr. Hann did not respond to e-mail questions on Thursday seeking an elaboration on his party’s concerns. In response, Ms. Wang said she was approached by both federal Liberals and Tories. She said the Tories mentioned the idea of running in a Burnaby-North riding, but she neither accepted nor rejected the idea before committing to the Liberals. Burnaby South was vacated when NDP MP Kennedy Stewart resigned to run for Vancouver mayor. The by-election was announced last week and the Liberals have until Feb. 4 to announce a new candidate.